In January 2014, Logic Branch was approached by the two founders of a nascent startup with plans to revolutionize the way that clinical trials engaged with patients, with the twin goals of improving recruitment and delivering better medical care. The challenge of bringing new medicines to market is that half the studies we do fail because they can't find the right number of patients for these studies. Or the patients who enter, become disheartened, and drop out. So our goal is to create an engine that can find the right patients for those studies and then engage them in a way that keeps them involved until the very end. To lower the cost of developing medicines,"
A core component of their vision was helping practitioners transition from using paper records to a touchscreen tablet, something that had just been made possible by the FDA’s rule change in late 2013 to finally allow electronic source data in clinical trials. The first thing they needed was a prototype that could show the potential for a tablet interface to make an intuitive replacement for an area of practice where familiar paper forms had long reigned supreme. 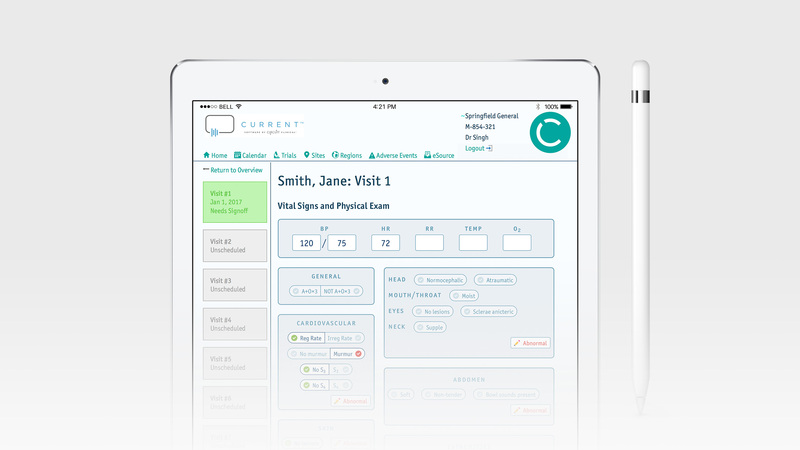 We built an iPad app that demonstrated the trial enrollment process, including the informed consent process, as well as capturing health records such as vitals and lab results. We delivered this along with some branding materials they could use to support the presentations they were doing. Once the founders had started bringing investors on board and were growing their team, it was time to turn our prototype into real software. The system we developed consists of two components. The first is HIPAA-compliant server software written in Ruby on Rails, with a web-based interface for staff at the main office to use. This software provided features to allow a research director to setup a new trial in the software, which included defining the on-boarding process for adding new sites to the trial, as well as the complete trial protocol for subjects, such as the visit schedule and the procedures to be performed at each visit. Rounding out the feature set was support for a safety officer to monitor and adverse events across the entire network of participants. The second is an iPad app that provides a streamlined interface for clinicians to use in the field, i.e. at doctor’s offices in the room with a patient. This app provided two factor authentication to protect patient data, and enabled a research coordinator to enroll new subjects in a trial, collect relevant health records, and schedule future visits. By 2017 the startup had grown into a successful company, and rebranded itself as Circuit Clinical as part of this transition. They had agreements with 30 physician practices, and entered into a partnership with ePatientFinder, creating the largest clinical research site network in the nation, with 170 sites nationwide representing a pool of with 3.5 million potential patients eligible to access a trial. At this stage of their growth, Circuit Clinical needed to be fully self-sufficient, so we trained their staff in managing the software we had built for them, and we assisted them in hiring in-house software development talent to take over the maintenance and evolution of the software. After a period of training and technical support, in January 2018 we handed over primary responsibility for the code to their in-house staff, marking a successful completion of a four year partnership in helping to launch their startup from scratch.